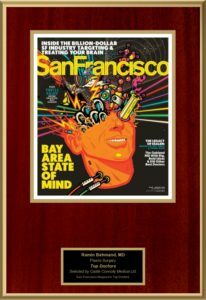 Dr. Behmand has been nominated by his peers and awarded the Bay Area Top Doctor Award for 2019. Many doctors are recommended and only a handful are chosen within each specialty. After being nominated, careful consideration and research is performed to check hospital affiliations, board certification and years of experience, professional and educational experience, no history of malpractice suits or disciplinary action and more. Check out the article in the January edition of San Francisco magazine online or in stores. Congratulations Dr. Behmand !